Last weekend was NASA's International Space Apps Challenge - a global hackathon hosted by NASA, that poses a range of challenges affecting the world today and gives teams 48-72 hours to solve them. These teams are by no means just engineers. Scientists, designers, writers and all those with a drive to solve problems are welcome to participate. York has been a Space Apps Centre for the past 3 years. Participants are welcomed to the Computer Science Department to work in their teams for the duration of the competition. At the end of the competition, entries are judged by a local panel, and the winners of the local round are put forward for global judging by NASA. I hadn't participated in Space Apps before this year - or any hackathon at all for that matter - so this was going to be a first on multiple fronts. My team made the trip up from Cambridge to arrive at York in time for the start at 9:00. Each year, there is a large variety of challenges to choose from, spanning multiple disciplines, from app design to fashion design. The challenge my team chose to do was called AirCheck. 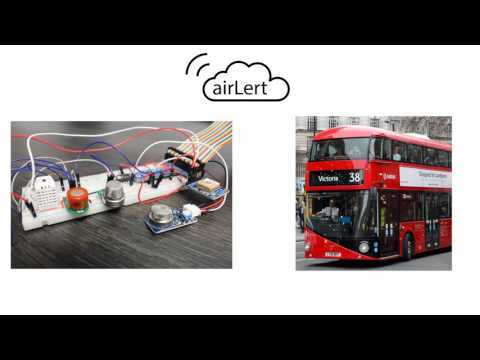 To summarise, the problem set out by AirCheck is to create a platform to collect air pollution data, and a service that allows users to input their air/breathing related health problems. The platform must then use this data to output something useful to the user, such as plotting symptom frequency and intensity on a map, or showing pollution hotspots. The key to getting this data was where we put the sensors.We reasoned that in order to achieve what the brief was asking, we needed to sense over as large an area as possible, and as often as possible. Yet, the sensing cannot be too expensive, otherwise it would not be viable to implement.We decided that we would combine the sensing system with a GPS module, and mount it onto hybrid buses(and potentially other forms of route - based public transport). This would provide us with a robust dataset over areas frequented by buses, which could be used to identify trends and anomalies over time, and maybe forecast future trends. The second part of our solution was the software.We created a webapp called in which users can sign up, and inform us of their health concerns. The service would then be able to display collected data pertaining to your locality, send you customised air alerts(or "airLerts") when the level of a pollutant you are sensitive to is particularly high on e.g. you commute, and suggest an alternative route that avoids the pollution. The app will also allow users to input their current symptoms, if they are feeling anything unusual. In practice, not everything described was fully implemented, since there just isn 't enough time in a hackathon. By the end of it however, we had a working sensor platform that could push relative air readings to the cloud with GPS coordinates in near real-time. We were even able to take the sensors for a drive, and get some real data plotted on the map in our webapp (pictures below). In addition, our webapp was quite usuable, updating periodically with the latest sensor readings, and providing some dynamic journey planning functionality. At the time of writing, global judging is still in progress.The global round is judged based on short video each qualifying team submits, which you can see below.We are looking forward to the results! The nature of the Challenge is that everything is free and open.You can find all of our code on Github, if you'd like to take a look!